This weekend sees the running of the 5th Vibram Tarawera 100 ultra, and there is some serious talent knocking about in this race. So much so, that both myself and Marcus decided it was too good an opportunity to miss. So on a plane we did fly* and we now find ourselves in the thermal spring capital of the World, Rotorura. This place is fantastic, and having just run the 7km fun run in the Redwoods Forest, which is literally on the doorstep of Rotorua, you can see why this race has built up such a following. 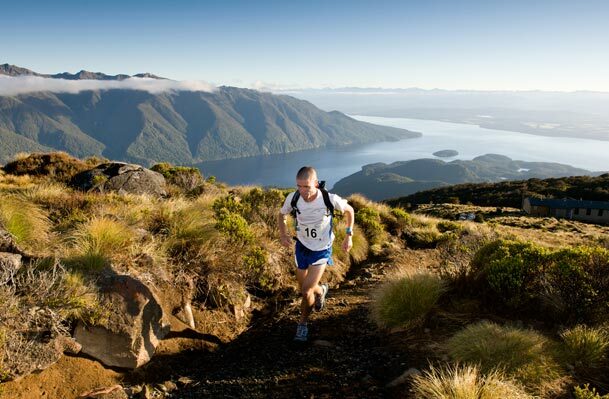 The venue is fantastic, it’s a trail runners paradise and a lot of credit must go to Paul Charteris, race director and his work with the various tourist boards who actively seek to promote trail running here in New Zealand. It’s fair to say that this race has one of the best line-ups ever seen at a Southern Hemisphere trail race in recent times, probably eclipsing the time when God himself (Kilian Jornet), came to town for a jog in the Blue Mountains a few years back. Timothy Olsen, current Western States 100 champ and record holder, arguably the best 100 miler runner in the World right now. Sage Canaday, 2:16 marathon runner and amazingly quick full stop. Francois d’Haene, one of the best trail runners in Europe, along with Emilie Forsberg and local Kiwi gal, Anna Frost. But for now, we’re going to focus on the local boys, namely the Aussies and Kiwis who will go toe to toe with the best in the world right now. Top of the list is Brendan Davies, Aussie Ultra runner of the year and the guy who’s winning just about everything there is to win on the road and trail circuit right now. Alongside him are Dave Eadie and Mick Donges, last year’s champ and fresh off the back of a 3:35 6ft track run last week. From NZ, we have last year’s second-placed runner and Kepler winner, Vajin Armstrong, along with a lady who is hotly tipped in this race to give some of the boys a bit of a spanking too, Ruby Muir. Also in the mix will be local Aussie girl, Beth Cardelli who has had an amazing last 12 months with more trails wins than you can shake a stick at. To begin with, we give you some insight into the Aussie and Kiwi ladies in contention for the 100km race. And we kick off with the very talented Ruby Muir from New Zealand. Ruby hit the headlines as far as Aussies were concerned a few weeks back when she won the Shotover Mountain marathon over in NZ, beating Anna Frost in the process. No mean feat we hear you say. So for those who haven’t come across Ruby, who is she and what has she been up to? Ruby is another one of the sport’s rising stars at just 21 and with so much talent it’s insane. This is a big call, but we think Ruby could be a top 5 contender overall, which shows just how much regard people hold for her here in New Zealand. Ruby’s foray into running came from quite personal reasons and a turbulent time in her life back when she was just 17, but out of sadness, comes great things, and Ruby is certainly that. 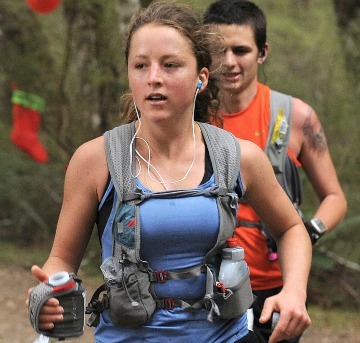 Being from New Zealand with its mountainous terrain, she loves the technical climbing side of trail running, knocking up around 120-140kms a week in an average week. In speaking with Ruby, she thinks that the course change (due to the fire conditions), is going to suit her down to the ground, given that runners will run back through the most technical sections twice on the new out and back course. The course change is going to make time predictions a little harder to estimate this year. Ruby informs us that had the course been the same as last year she might have been looking at somewhere around the low 9’s in terms of time, so that gives you an indication as to where she’s at. As far as the 100km title is concerned for ladies, we think this one is Ruby’s. Next we turn our attention to a local Aussies girl many of you will have come across, namely Beth Cardelli. Australian Ultra athlete of the year, and again winner of every race she entered in 2012. Beth has struggled with injury of late however and has only just started building her mileage back up. For Beth, this race is probably more about getting her running back on track as she heads to Europe later in the year to race in Italy and also have a crack at a few of the Sky Running events in the summer season over there. In the men’s, Marcus will be bringing you all the action from the pointy end of the field with the crop of international runners that have made their way over to race. But for this article, we’re focusing on the homegrown talent, and for us that’s, Vajin Armstrong, Brendan Davies, Mick Donges and Dave Eadie. What’s great about speaking to these guys is the leaps and bounds in terms of improvement that we’ve seen from all of them over the last few years. These guys really have taken the Australian and New Zealand trail running scene forward with some great results against world-class runners. Vajin in particular has made his mark in the US, Brendan is a sub 7 hour 100km runners, Dave is Mr. Consistent and still running marathons in the 2:4x at 42 and Mick is last year’s winner of this race. Earlier this evening, I managed to do a group interview with all three guys (along with Dave earlier in the day), which was great fun and for me, and a fascinating insight into how these guys train and prepare. Vajin is a delight to chat to, articulate and extremely well-grounded as to what it takes to be a top class runner. I asked him about his training for this race and it’s clear that he’s extremely focused on doing well here. It’s not often that these guys get the chance to race against the likes of Sage Canaday, Ricky Gates and Francois d’Haene. Brendan too has spent a great deal of time preparing for this race, and I’ve been fortunate to be racing alongside him for a few of those races, even if it were only to see him at the start. 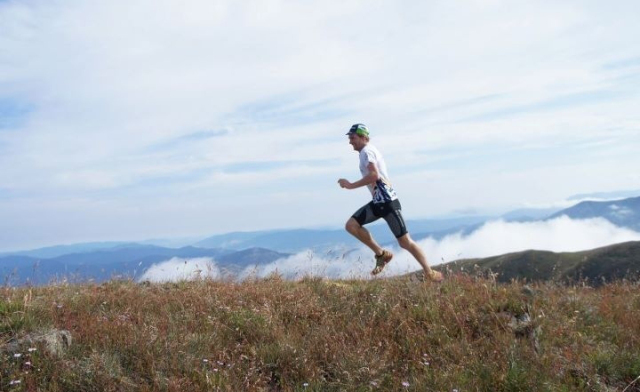 He’s had great results at both The Knapsack 6 hour solo race (which he won with around 75kms), as well as a snappy 3:16, 50km win at the Stromlo Running Festival. Brendan races a lot, and invariably wins these races too. The course change however isn’t much to his benefit. Brendan has speed to burn and was hoping to be knocking off a few scalps along the 40kms of fire trail on the original course. The slightly more technical stuff might not suite him as much, but you can bet he’ll be right up there as well. Then we have Mick Donges. Mick is also a great personality to chat too, with his laid back attitude and approach to racing. In a world where many are serious in their endeavour, Mick reminds us all as to why we run – simply for the love of it. Mick by his own admission has cut back the kms, but not the time, seeking out steeper and gnarlier runs than ever before. As a reminder to us all, Mick smashed out a 3:35 Six Foot Track last weekend finishing in the top 5, no mean feat for someone on taper for the big race this weekend – that, if anything shows you the kind of form Mick is in right now and we think a hard 45kms will do no harm to his chances this weekend. Finally we have Dave Eadie, the daddy of the pack and the man who’s been around the blocks for the last twenty years. There’s not much he hasn’t done… Western States, Badwater and Aussie 100km champ three times. Dave has had a good run in, knocking of 2:4x marathons in the process and again, another one who has cut back the kms in favour of quality and cross-training. Will it work? We think so. Dave knows how to hurt and has performed well at this race. So what of time predictions from our valiant quartet of runners? Well, Vajin kicked things off by saying that he thought the low 8’s would have been a sure fire target on the original course. As it happens, and with the change, it’s hard to say. We do however think that the likes of Vajin, Brendan, Dave and Mick will all be toeing it at the front – but can each of them hold on against the speed of someone such as Sage? The guys are also of the belief that with a far faster 60km race in the offering, the pace out front will be hard from the off. Will any of them blow hard and take some cookies out of the jar early on? Probably. This men’s field is highly competitive with a good 5-6 runners who could quite easily take out the race. Who do we think will win? It’s a tough one, but you can’t ignore the talent of someone like Francois, along with the likes of Sage too. Vajin seems to be right on form and incredibly focused for this race, as too does Brendan. The international guys too are only just coming into their season, whereas our boys have had a whole summer of fun to get battle ready. One thing’s for sure, our guys are going to give it a bloody good crack. All the best gents and ladies. *You know we like to be transparent about this stuff, both Marcus and I paid our own way to come to NZ, not at the expense of the organisers. what a great line up, will be following with interest, and that terrain….makes you want to out there and run! Cheers Kristian, sorry about that, all changed. I put my money on Vajin for the Men’s race. I was fortunate enough to do a few training runs with him when he was out here for the Triple Tri last year. He is kind, articulate, trains like a demon, and most importantly, has a very flexible mindset needed for racing at this level. Nevertheless, I hope some of the equally charming Aussies can push him and perhaps steal the podium.